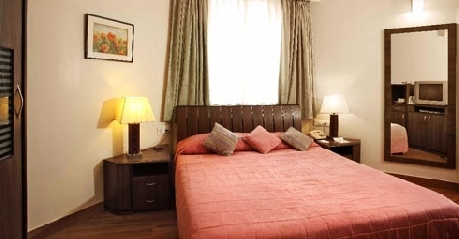 Located in downtown Kolkata, the Astor is one of the finest three star properties that offers classy accommodation choices along with premium comfort and lavish luxuries. The hotel is housed in a 100 year old building that has earned heritage status. Therefore it sports unique structure with Victorian style architecture and décor. 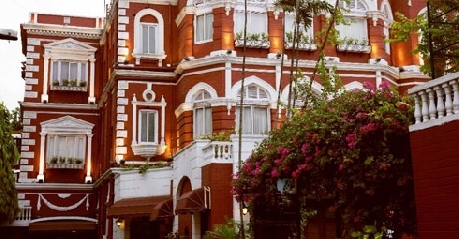 On the exterior, the hotel sports typical red brick design with white trims, that offers the simple yet elegant old world charm to the surroundings. 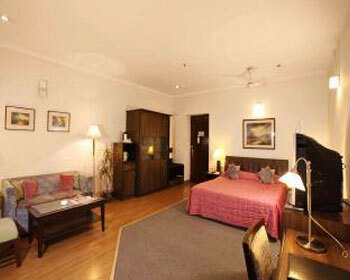 Patrons can choose to stay either in Deluxe double rooms or Suites offered by the Astor Hotel. In line with the elegant old world style, the rooms also sport very simple yet impressive décor with Victorian style interiors. Equipped with all contemporary amenities and facilities; the rooms at Astor are sure to cater to any and every requirements of a modern day travelers. Keeping the culinary tradition of Kolkata alive, the Astor has developed two delightful restaurants i.e., PLUSH – the Italian & Mediterranean Cuisine, Kebab–e-Que – the Indian & Oriental Cuisine specialty diner. Patrons who like to enjoy a drink of two can head to Cheers Bar, which serves some of the popular and rare spirits. 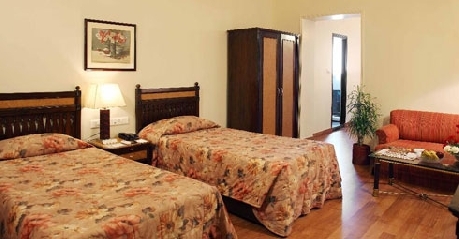 Apart from these, the hotel has offers other features and facilities such as express laundry service, parking facility, doctor on call facility, conference halls, board rooms, high speed internet access and others; to keep patrons satisfied during their stay here. Client centric hospitality and old world charm; these factors make the Astor stand apart from competition. Blending classy comfort and premium luxuries; the Deluxe double rooms available at the Astor Hotel have earned rave reviews from guests. 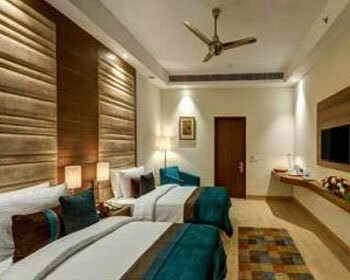 The rooms are very pleasant in feel and immediately charm the guests who choose to stay here. Designed by expert designers keeping in mind the specific demands and needs of modern day travelers; the Deluxe Rooms are able to offer maximum comfort and convenience to guests. The Deluxe rooms sport very classy décor that is complemented by elegant interiors and cultural elements that adorn the rooms. Even on the front of amenities, the room doesn’t disappoint. The Deluxe doubles are equipped with state of the art modern amenities and features such as complimentary breakfast, personal electronic safety deposit locker, telephone with international direct dial facility, tea and coffee maker, refrigerator, mini bar, television with satellite connectivity and subscription to premium channels and complimentary access to gymnasium. In addition to this, the guests can also request for separate seating bay, DVD player, hair dryer and in house DVD library from the management. 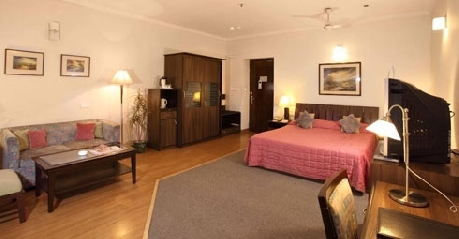 Looking for spacious and lavish accommodation choice for your families or group of friends in Kolkata? 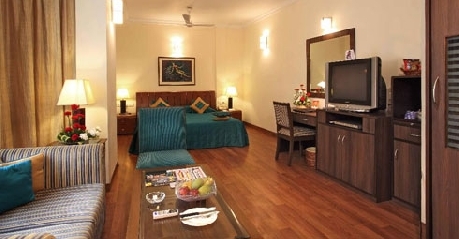 Then the Suites available at the Astor Hotel will surely impress you. These lavish suites are designed by expert architects in a unique style which opens up lot of space on the inside offering enough room to guests for their daily activities. Patrons have been very appreciative of the overall feel and appeal of the rooms, which is opulent and premium in general. The classy décor and elegant interiors are not only eye pleasing but also complement the room. The interiors are adorned with cultural elements, artifacts and paintings which are inspired from local culture and offer a glimpse of Bengal’s heritage. Patrons will be pampered with several modern facilities and services offered as part of these Suites. The main among them include complimentary breakfast, personal electronic safety deposit locker, telephone with international direct dial facility, tea and coffee maker, refrigerator, mini bar, television with satellite connectivity and subscription to premium channels and complimentary access to gymnasium. In addition to this, the guests can also request for separate seating bay, DVD player, hair dryer and in house DVD library from the management. Treat your taste buds with the best Italian flavors in town, by choosing to dine at PLUSH – the in house Italian and Mediterranean restaurant at the Astor Hotel, Kolkata. Right from the time you hear its name, the diner infuses a lavish feel and charm that makes dining here a very pleasurable experience. The lounge styled restaurant has very mature and sophisticated ambience, thanks to the classy décor and stylish interiors of the bistro. Menu is carved out expert Italian chef Davide Cananzi and in line with his reputation in the field of culinary arts; the food is truly an eclectic blend of finest flavors and innovative style. The bistro also houses a bar that pours some of the best spirits from major popular domestic and international brands. The music uplifts already charming aura of the restaurant which has Italian themed interiors and comfortable seating arrangements. So come and treat yourself with luxury, by visiting PLUSH. Kebab–e-Que has been part of Kolkata’s hospitality sector since past three decades and in this time the restaurant has earned its rightful place at the top of the list of dines offering Kebabs and oriental cuisine. Favorite among locals and tourists alike, the Kebab-e-Que offers authentic flavors of grilled and other exotic dishes from Indian platter. The oriental flavors are prepared by experienced chefs as per traditional recipe using best herbs and spices to bring out the best flavors in the preparation. Patrons are advised to try smoky kebabs that are favorite from here along with host of spicy gravies and other Indian exotic dishes. The overall décor of the diner is very elegant with the interiors adorned with artistic paintings and elements that are inspired by the culture of Bengal. 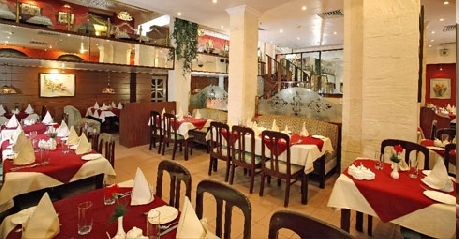 Comfortable seating and attentive service further enhances the experience of dining at Kebab–e-Que. Fancy a drink to let your hair down and enjoy a great evening with your friends? Then head to Cheers – the onsite Bar located on the premises of Hotel Astor, Kolkata. The bar offer very delightful and cheerful atmosphere thanks to its classy décor and stylish interiors. The bar is well stocked with any spirits and offers enviable assortment of labels and brands to choose from. Patrons who want to try something different can also try the wide assortment of cocktails listed on the menu here. They are prepared by the bartenders with a twist in the tail and are available in local flavors as well. Be it a solo drink, a chill out session with old friends or just a casual outing; Cheers will surely bring smiles to your faces and delight in your hearts.